A chemical compound is any substance that consists of two or more chemical elements always associated with one another in the same proportion, and that has certain properties deriving from that association that define and distinguish it from other substances. Two types of chemical compounds are known to chemistry. They are molecular compounds and ionic compounds. An ionic compound is any substance that exists only as a crystal consisting of two or more ions when not dissolved. Common salt (sodium chloride) is the classic ionic compound. As a pure solid, salt consists of sodium ions and chloride ions tightly associated in a crystal lattice. When salt dissolves, these ions dissociate and become merely so much sodium ions and chloride ions swimming in a sea of whatever solvent is used. No such thing as "a molecule of salt" can ever be said to exist. Ionic compounds typically dissolve only in polar solvents (see below). Molecules may be either polar or nonpolar. Polar molecules have an unequal distribution of electric charge among their atoms, giving them distinct positive and negative "sides." (The charge on either "side" of a polar molecule is almost never equal to the full charge on, say, a single proton or electron. If it were, then the particle would be an ion.) Nonpolar molecules distribute their electrons evenly and thus have no partial positive or partial negative charge on any aspect of them. In general, polar solutes dissolve in polar solvents, and nonpolar solutes dissolve in nonpolar solvents. Ionic compounds (see above) typically dissolve only in polar solvents. Molecular compounds are also either organic or inorganic. Organic compounds contain carbon; inorganic compounds do not. Polyatomic ions may also be organic or inorganic--though an organic polyatomic ion is usually a dissociated weak organic acid of the form R-COOH, where R is the rest, or residue, of the molecule. The chemical formula of any compound (ionic or molecular) is either a list of the chemical symbols of its constituent elements, with subscripts to describe their ratio, or else a slightly more complex listing or even a drawing intended to describe not merely the ratio of the constituent elements but also their arrangement. A chemical compound might have as many as three types of formulas. The simple formula simply lists the elements in symbolic form, with subscripts to describe their ratio. For example, water consists of two parts hydrogen and one part oxygen. Its simple formula is, therefore, H2O, that of the basic solute of common household vinegar (acetic acid) is C2H4O2, and that of common salt is NaCl. One usually describes an ionic compound only by a simple formula, though exceptions do exist. The graphic formula is a one-line list of the elements intended to show the physical orientation of the constituent atoms to one another. For example, the graphic formula of water is HOH. 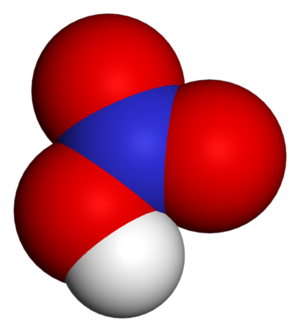 From this rendering, one can readily see that the water molecule has an atom of hydrogen to either side of an atom of oxygen. (This is a slight oversimplification.) The graphic formula of acetic acid is CH3COOH, and from this formula one can picture the acetic acid molecule as consisting of one atom of carbon, with three atoms of hydrogen bound to it, and also bound to another atom of carbon that in turn has two atoms of oxygen bound to it, one of which has an atom of hydrogen bound on its other side. Structure formula of Adenosine Triphosphate. The structural formula is an often elaborate two-dimensional molecular diagram showing the relationship of the various atoms to one another. 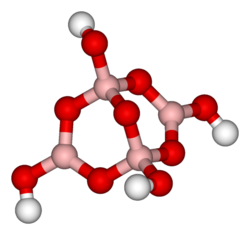 The structural formula for water would be H-O-H if one habitually used a structural formula to describe water. The most elaborate type of structural formula would mention each and every atom in the molecule, including hydrogen. Structural formula for acetic acid. But commonly used structural formulas for organic compounds typically leave off any hydrogen atoms bound to carbon (and assume that hydrogen atoms are bound to any vacant positions on any carbon atoms), and represent the carbon atoms as corners in an angular drawing of the backbone of the molecule. Thus a simplified structural formula for acetic acid might look like the one at left. Here one assumes that a carbon atom resides at the end of the backbone and at the center, with three hydrogen atoms occupying the vacant spaces on the carbon atom at the end. Organic compounds have graphic and structural formulas; such formulas are usually unnecessary to the description of inorganic compounds. The simplified molecular input line entry specification is a one-line specification of a structural formula that does not require any special data types or drawings. For details, see the linked main article. The SMILES for carbon dioxide is O=C=O, and that for acetic acid is CC(=O)O. The SMILES for sodium chloride is [Na+]. [Cl-], a form that emphasizes the character of this compound as a crystal or other pairing of disconnected ions. The molecular mass of any compound (molecule or ion) is equal to the sum of the atomic masses of its constituent elements. If the compound is an ion, then the terms formula mass may more properly describe this quantity. A molecular model is a physical model that represents the 3-dimensional spacial relationships of atoms in ions or compounds. Molecular modeling is also used to describe chemical processes. One of the most common molecular models is called the ball-and-stick model wherein atoms are represented by spheres of different colors. With these models, the concept of the chemical bond as a direct link between atoms can be modeled by linking balls (atoms) with sticks/rods (bonds).Space-filling models are similar to ball-and-stick models, but the atoms are represented by spheres whose radii are proportional to the radii of the atoms and whose center-to-center distances are proportional to the distances between the atomic nuclei (see image at right). Chemical Names of Common Substances By Anne Marie Helmenstine, Ph.D., About.com Guide. Accessed January 26th, 2011. ↑ Molecular Model Wikipedia, Accessed February 21, 2013. ↑ Space-filling model Wikipedia, Accessed February 21, 2013. This page was last modified on 4 September 2013, at 17:23.